CAMBRIDGE, Sep 7 2017 (IPS) - “Ivory is like a drug and you have to be careful with it. If you are serious and desire it, you can get all you want, but you have to be patient and act very carefully,” a Cameroonian man selling ivory items from a network of shops across Central Africa, told TRAFFIC investigators in 2014. A new report, launched September 7 by TRAFFIC, the wildlife trade monitoring network, contains interviews and findings over a period spanning almost ten years from dozens of such men, all active participants in ivory trafficking within Central Africa. In the first comprehensive ivory market assessment in the region in nearly two decades, the TRAFFIC investigators posed as buyers at known and newly identified ivory markets and workshops across Cameroon, Central African Republic (CAR), Congo, Democratic Republic of the Congo (DRC) and Gabon: key source countries fuelling ivory trade in Africa and beyond. They also held consultations with major stakeholders, including government officials in all five countries. The collective opinion they documented was a world where weak governance, corruption and shifting trade dynamics were highlighted as significant factors seriously undermining the control of ivory trafficking throughout the region. In DRC, one ivory trader claimed to have a relative in the army who supplied him with raw ivory. He also alleged that the main suppliers are government officials and, to some extent, UN peacekeepers, who have the ability to move around the country frequently. Also in DRC, researchers recorded well-informed claims that the FARDC, the country’s official army, was one of the main groups responsible for elephant poaching in Virunga National Park, with the ivory exported by the non-State “Democratic Forces for the Liberation of Rwanda” (FDLR). The study found the trade has shifted from an open domestic retail trade of worked ivory to underground transactions with a focus on the export of raw ivory to foreign markets, especially China. Nevertheless, throughout the multi-year investigation, market research showed that the region’s open illegal ivory markets were fast disappearing—with the exception of Kinshasa, DRC (whose market was recently closed). TRAFFIC investigators recorded less than 1 kg of ivory products openly displayed in 2014 and 2015 within CAR, Congo, Gabon and Cameroon, compared to around 400 kg in 2007, and more than 900 kg in 1999. So what has caused local ivory markets to disappear? Certainly, the increasing pressure from authorities conducting frequent law enforcement operations had played a role, but the underlying driver appears highly sinister. 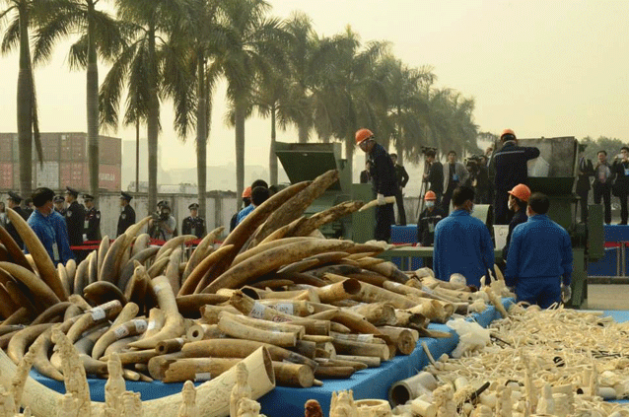 The study found the trade has shifted from “an open domestic retail trade of worked ivory to underground transactions with a focus on the export of raw ivory to foreign markets, especially China.” Meanwhile, a common theme heard throughout the sub-region were allegations concerning Chinese citizens operating within organized criminal networks as key actors in the trafficking, which has reduced the availability of ivory for local retailers and carvers. Amid this troubling scenario—where criminals involved in international ivory trade are regularly exploiting weak State governance and official collusion, confusion and corruption—what hope is there for the region’s future and that of its elephants? Clearly the Central African countries face significant governance and enforcement challenges and urgently need to ramp up their efforts under a range of commitments made at multiple international fora over the last ten years. But, as long as corruption remains rampant and there is official collusion with trafficking networks, these bold intentions will inevitably be undermined. This July, the G20 summit ended with leaders pledging to address the corruption that facilitates wildlife trafficking: a crucial step to stopping illicit ivory trade. With this high-level commitment is in place, will the resources to implement it now follow? Last month, media reported that Zhang Yiming, the new Chinese ambassador to Namibia, had offered his country’s support to Namibia and other Southern African Development Community (SADC) countries to launch a robust joint regional law-enforcement initiative to tackle the trafficking of elephant ivory, rhino horns and other wildlife products, as part of China’s resolve to combat the scourge of poaching. If the same offer was available to the countries of Central Africa, it is one they can perhaps ill afford to turn down. Ivory Markets in Central Africa – Market Surveys in Cameroon, Central African Republic, Congo, Democratic Republic of the Congo and Gabon: 2007, 2009, 2014/2015 was funded by the French Ministry of Ecology, Sustainable Development, Transport and Housing, WWF France and WWF International, as well as the United States Agency for International Development (USAID) under the Wildlife Trafficking, Response, Assessment and Priority Setting (Wildlife TRAPS) Project.